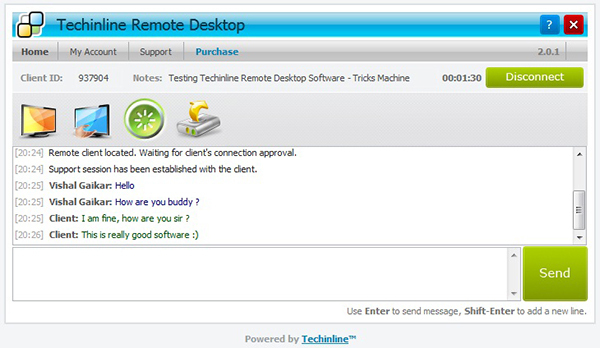 The easiest way to access your computer remotely is using Techinline Remote Desktop Software. Techinline is a browser-based remote support tool that enables instant, secure, and trouble-free connections between remote computers over the web and to any point on the globe. Sometimes it happens that you are working in your office or you are traveling to some city, but at the same time you need to do something on your home computer, Let’s say, you want to view your personal mails or want to check some bills which is on your Home PC. OR sometimes you may get sick and won’t be able to leave your house, but the project deadline is close and you need to finish the project, at this moment to get access to your work PC when you have a high fever is not a really good idea. That is when Techinline Remote Desktop Software comes into play! With its help you will be able to see and work with the remote computer as if it is your own local machine. Distance does not matter any more! Techinline Remote Desktop enables users to view, diagnose, and, if needed, take full control to resolve any problems on a remote computer which can be located at any point of the world. No matter how far the specialist is from the client, Techinline Remote Desktop works as if the two machines are located on the same table. Techinline Remote Desktop Software is powered by innovative Techinline Remote Desktop technology, the software is oriented not only towards large and medium sized businesses, but also towards the needs of small firms and ordinary PC users.With the help of Techinline, you can set up remote access to your computer in a few minutes. I can say, Implementation is quick and easy. I have personally tried this software, it’s very easy to use, You only need a browser and an internet connection to launch a remote support session between any two computers. The entire connection process is as simple as it gets! Log into your account online to start the support session, then direct your customer to techinline in order to obtain a 6-digit Client ID number. Enter this number into the corresponding field on your end to instantly start resolving any technical issues on the remote desktop. If you can see above screenshot, here you can chat with the client also this window gives you permission to Remote desktop control and Remote desktop view and Local desktop control and Local desktop view options. This is very simple and reliable to use, it’s presented by Techinline’s browser-based technology provide you with the capability to offer immediate service and ad-hoc support to practically anyone around the globe. The tool also can automatically store data about conducted sessions. Quickly and efficiently generate a comprehensive report of previous connections, which can then be used for billing or invoicing purposes. The App automatically adjusts the view of the remote desktop if its screen resolution is higher than yours, with switching Auto Scale and Auto Scroll feature. You can transfer files, folders and clipboard content from the local computer to the remote computer and vice versa content. Remotely control any desktop anywhere in the world. Transfer files/clipboard between the remote and local computers. Reboot and reconnect the remote computer. Send and receive text chat messages. Techinline is web browser based remote Desktop software so no need to install any software for both the participants, just you have to get ready with your credentials. As it supports Windows 7 Compatible, 64-bit Version and does require any pre-installation or downloading software on either machine. So the Techinline remote desktop software is the best solution to access your computers remotely and which can provide your business a complete support based service.